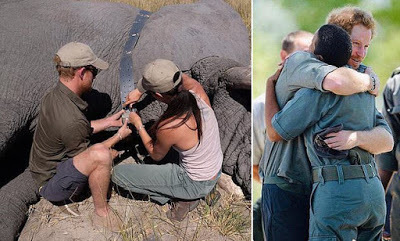 Prince Harry and Meghan shared never-seen-before pictures of them tending to an endangered elephant in their latest Instagram post. The photos were taken in Botswana in 2017, when the couple travelled to assist Dr Mike Chase of Elephants Without Borders in equipping a bull elephant with a satellite collar. Harry took Meghan to his favourite camp Meno a Kwena to celebrate her 36th birthday. The post came after the Duke of Sussex joined his brother and father at the premiere of David Attenborough’s latest documentary Our Planet at the Natural History Museum. The pair wanted to show off their support for protecting the environment. The caption read: ‘The Duke of Sussex attends the “Our Planet” premiere at the Natural History Museum with the Prince of Wales and the Duke of Cambridge leading their joint support for the protection of our environment. ‘As president for African Parks Network, the Duke of Sussex continues to advocate for the communities and wildlife that coexists in some of the most vulnerable environments around the world.